If you are a business owner who needs to a proven commercial van, the 2019 GMC Savana Cargo remains one of the best options on the market. Although this van hasn’t changed much over the years, it still gets the job done. You’ll enjoy the GMC Savana Cargo’s simple interior design and strong performance. Furthermore, even the base model now comes standard with features that promise to make your work day more enjoyable. While the 2019 GMC Savana Cargo remains mostly unchanged, some valuable safety technologies have been added to the van’s list of options. This change helps the Savana Cargo to keep pace with the competition. Although you can opt for a different engine, the standard V6 engine is more than capable. You’ll appreciate the engine’s smooth power delivery and overall responsiveness. It’s rated to churn out a satisfying 276 horsepower and 298 pound-feet of torque. This is enough muscle to tow up to 7,400 pounds. Although the V6-powered Savana Cargo isn’t a speed demon, expect to experience effortless highway merging. Decent fuel efficiency is yet another plus. If you need the maximum muscle, step up to the V8 engine. GMC tuned it to produce a healthy 341 horsepower and 373 pound-feet of torque. As soon as you step on the acceleration, expect to notice an extra kick under the hood. Even when hauling a load, there’s more than enough power on tap. The confidence of knowing you’ll never have trouble merging into heavy traffic is well worth it. Maximum towing capacity increases to 10,000 pounds with the V8 engine. Don’t overlook the benefits of the optional four-cylinder diesel engine. It’s a great choice for the folks who want to maximize the van’s fuel economy. Although the EPA doesn’t provide fuel economy estimates for the diesel-powered Savana Cargo, expect to be impressed. However, this engine also has the ability to work hard. Output stands at 181 horsepower and a significant 369 pound-feet of torque. Because of the engine’s high torque, acceleration feels effortlessly around town. When running a business, reliability is of the utmost importance. Downtime due to a troublesome vehicle will definitely cause you to lose money. Over the years, the Savana Cargo has proven itself to be a dependable workhorse. This is an especially big advantage for the drivers who are constantly on the go. You can also take advantage of the Savana Cargo’s low-maintenance design. All of the key mechanical components are easy to service. The 2019 GMC Savana Cargo is designed to help you work more efficiency. While available assist steps make entering and exiting a lot easier, optional sliding side doors enable you to quickly grab cargo. Meanwhile, a low cargo floor further decreases your workload. Of course, you’ll also grow to appreciate the interior’s simple controls. From the climate control system to the stereo, everything is a breeze to use. Although the 2019 GMC Savana Cargo has some modern features on the inside, it looks a lot like a van from the 1970s. There are plenty of drivers who will appreciate the Savana Cargo’s old school styling. The van’s boxy design will definitely withstand the test of time. This means you’ll never have to worry about the Savana Cargo looking aged and dated. If you want to spruce up the van’s look, opt for the Chrome Appearance package. The internet has become more important than ever before. In fact, the success of your business could be impacted by your ability to readily access the web. Luckily, a 4G Wi-Fi hot spot comes standard on the 2019 GMC Savana Cargo. Whether you’re traveling locally or heading out of town, you’ll always have a reliable connection to the internet. Because the hot spot can support multiple devices at one time, an entire work crew will be able use it. Everyone will benefit from GM’s OnStar emergency communications system. This awarding-winning system gives you a 24-hour link to roadside assistance. By simply pressing OnStar’s “SOS” button, you’ll immediately be connected to an emergency respondent. In the event of an accident, Automatic Crash Response sends help to your specific location using GPS. Stolen Vehicle Assistance is another perk that comes with OnStar. Aside from helping you out in troubling situations, OnStar can also provide turn-by-turn navigation directions. Safety has become a big concern for today’s drivers. While the Savana Cargo comes standard with a backup camera, you can also take advantage of its newly available driver-assist technologies. Designed to detect unexpected vehicles in the road, Forward Collision Alert helps you to avoid a dangerous crash. Meanwhile, lane departure warning helps prevent unintentional drifting. Side Blind Zone Alert is also available, which helps you to securely switch lanes on the freeway. As you may know, entertainment features can make the work day go by a lot quicker. Although the 2019 GMC Savana Cargo is not luxurious, it does offer some features to enhance your music-listening experience. Bluetooth audio streaming and satellite radio enable you to jam to your favorite songs. A CD player is available as well. The 2019 GMC Savana Cargo is a big, powerful van. It’s designed for hauling and towing a sizable load. On the downside, fuel expenses will be higher. 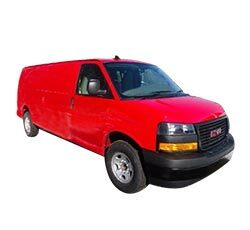 If you don’t need the Savana Cargo’s enhanced capabilities, search for a smaller van. A lot of people recommended the compact Nissan NV200. According to the latest EPA estimates, you can expect the NV200 to return a combined 25 mpg on regular unleaded gas. While features like A/C and power windows come standard on the Savana Cargo, you don’t have access to many other creature comforts. It feels like a basic commercial vehicle. If you’re willing to spend more money, the 2019 Mercedes-Benz Sprinter will treat you to a more luxurious ride. It offers several premium features. While upgraded front seats with heating make winter trips a bit more relaxing, a sunroof allows a fresh breeze to enter the cabin. Don’t expect the 2019 GMC Savana Cargo to deliver the best handling. It drives more like a big truck. When taking sharp curves, you’ll definitely need to reduce your speed. Models featuring an extended wheelbase are especially difficult to park in tight spots. For this reason, drivers may be forced to park further away from their drop-off location. The 2019 GMC Savana Cargo can be equipped with an infotainment system. Unfortunately, it’s far from the most advanced interface in the segment. Not only are the graphics dated, but the touch-screen display is often slower to respond. You’ll find the Ford Transit’s avaialble SYNC 3 infotainment system to be far more rewarding to use. The 2019 Mercedes-Benz Sprinter is a solid choice. Drivers will appreciate its available high-end features. However, prices for the new Mercedes-Benz Sprinter are far more expensive. You’ll also find the Savana Cargo to be more affordable to maintain. The 2019 Ford Transit cargo van proves to be a great choice as well. However, some drivers will prefer the Savana Cargo’s more straightforward interior design. Don’t forget about the 2019 Ram Promaster, which has received high marks for its versatility. However, only the Savana Cargo comes equipped with a helpful “limp home system”. If you happen to be experiencing a coolant leak, this system enables you to safely make it back home. You can also take advantage of the Savana Cargo’s GPS-linked Onstar emergency communications system, which is not offered on the Ram ProMaster. Although the 2019 GMC Savana Cargo may not be the most high-tech commercial van on the market, it remains a great work vehicle. You’ll appreciate the Savana Cargo’s low-maintenance design and easy-to-use features. Despite having a dated interior design, the 2019 GMC Savana Cargo still offers popular features like a 4G Wi-Fi hot spot and Bluetooth.